The NASCAR Busch North Series schedule was rounded out this week with the addition of Lee USA Speedway as a season opener on Sunday, May 15th. The first draft of the series schedule had not included the race. Meanwhile, out in Western New York, a track will be lost at the end of 2005. Tioga Motorsports Park will close its doors forever after a limited season of special events. Chuck Hossfeld hopes to hit Tioga with the #22 team on Memorial Day weekend. There might have been nobody happier about that news than series regular Eddie MacDonald, who cut his racing teeth at the track that his family actually owns and operates. MacDonald returns to the track’s Late Model division periodically and knows that track very well. A big event for the facility is planned for May 29th and there is one NASCAR Modified Tour ace who has that marked on his calendar for a possible appearance. News of the Lee race made its way to Racearama last weekend, where a homemade sign was put up right away with the latest scoop. The team will also run a third entry in selected events for Brad Leighton. Just when it appeared that the New England race show season was over, another event has made it to the schedule. The Maine Motorsports Festival is planned for the Central Maine city of Lewiston next weekend. The show promises to combine live entertainment, race cars, drivers signing autographs and meeting fans as well as a few other attractions that might be out of the norm for race shows. New England Patriot cheerleaders, a rock climbing wall and target shooting are among the non-racing activities planned. The show will take place on March 18th and 19th at the Le Colisee (formerly the Central Maine Civic Center) in Lewiston. There was so much going with the NASCAR Whelen Modified Tour world this week, that it didn’t all fit into Northern Exposure. Please click here for the latest from the Northeastern ground pounders. Hossfeld has some memories of racing at the track and the one that sticks out the most in his mind is how he went from midpack to the front by trying what the regulars did – replying on a little “magic”. During the winter, it was announced that Mike Stefanik would have a new crew chief for his #55 Grizco Racing Busch North entry. The only problem is that crew chief was to be Andy Santerre who has won the last three Busch North titles. The temptation to field a team car for Santerre to race in 2005 has been too strong for team owners Steve and Peg Griswold, so now Stefanik has a teammate and no a crew chief in the Maine native. 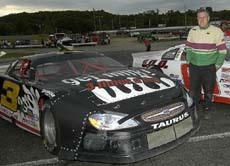 So to fill that void, the #55 operation has hired former Maine Pro Stock driver Jerry Babb as Stefanik’s top wrench. Babb moved to North Carolina last year and has helped out ASA and USAR Pro Cup teams in his free time since then, while also juggling a day job. Now, he’ll be working out of the Harrisburg, North Carolina Grizco shops full-time.